It seems appropriate to pay homage to country music legend Willie Nelson when I’ve just spent the major portion of the past week at a mystery writers conference in the country music capital. 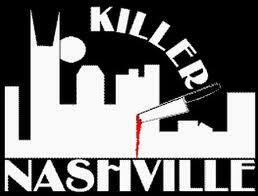 Killer Nashville provided lots of opportunities for me to grow as a writer with interesting panels, presentations, and workshops. And, there was ample opportunity to network with other writers from throughout the U.S.
Dr. Bill Bass, a pioneer in forensic pathology, delivered the keynote address. Dr. Bass created The Body Farm in east Tennessee, the first laboratory for studying the decomposition of human remains, and an early CSI training ground. He entertained us with amusing stories about crime, something that may only interest mystery writers. At one point, he demonstrated the trajectory of two bullets used to shoot a man in the head. For the first bullet he had a little stick with a flag on the end; for the other he used his wife’s knitting needle. Despite the seriousness of his topic, he was witty and informative. A second interesting element of the conference was the Crime Scene. Tennessee Bureau of Investigation Special Agent Mike Breedlove and his team recreated the scene of an actual crime in the hotel’s parking lot. They laid down cigarette butts, a damaged cell phone, a pillow with loose feathers, and ski mask. There was a dummy representing the body, blood stains, bullet casings and tire tracks. We were given basic information about the principles in the crime and invited to solve it. There were a couple of presentations based on real crimes that provided lots of information for the crime writer. In one, no body of the victim was ever found. Nashville homicide detective Sgt. Pat Postiglione showed us how the police were able to build a case against the victim’s husband. In another, former IRS Criminal Investigation Division agent Lee Williams outlined a complicated Chicago crime involving drugs, police corruption and murder that served as the basis for his novel, In His Blood. On a lighter note, we played a mystery trivia game based on the television show Jeopardy. I captained the red team, made up of a group of writers with a broad knowledge base ranging from hard boiled to police procedure to history of the genre. We won! NOTE: Next week I’ll be back in Rome and Intrigues from Italy will return.